The UAP-IW is ideal for retrofitting an existing in-wall wired Ethernet jack to a wireless access point. It also provides one RJ45 data port and one PoE port to connect devices like a VoIP phone. The UAP-IW is capable of speeds of up to 150 Mbps with a range of up to 25m. The UniFi Enterprise Wi-Fi System is a scalable enterprise access point solution designed to be easily deployed and managed. 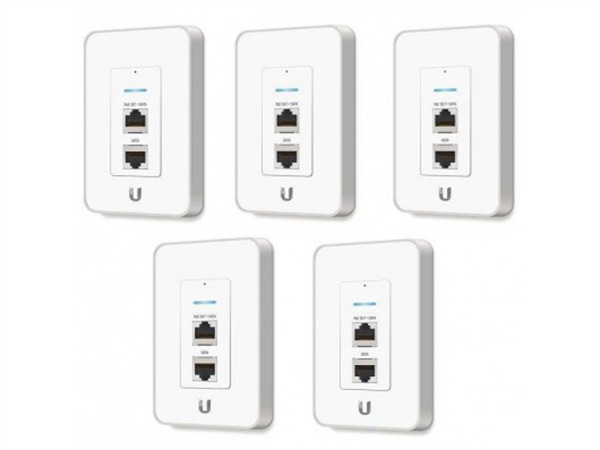 UniFi Access Point (AP) indoor models have a sleek design and can be easily mounted to a ceiling tile or wall using the included mounting hardware. UniFi AP (UAP) outdoor models have a form factor built to last outdoors. The UniFi Enterprise Wi-Fi System includes the UniFi Controller software. The software installs on any PC, Mac, or Linux machine within the network and is easily accessible through any standard web browser. Using the UniFi Controller software, an Enterprise Wi-Fi network can be quickly configured and administered without any special training. Real-time status, automatic UAP device detection, map loading, and advanced security options are all seamlessly integrated. Note. The UAP-IW requires a Switch with PoE for power. Passive PoE adapters are not recommended.